The theory of classical Indian marman can be traced to early Vedic civilisation (1700-1000 BC) (Zysk, 1998) and (Wujastyk, 1987). Originally used in warfare throughout northern and southern India, marman chikitsa has received special attention in southern India, not only for fighting, but for therapeutic use. The Dravidian or southern Indian varman theory is believed to be older than Ayurveda, and its origin may be traced to two historical figures – Parusharam and Agastya (Nair, interview, 21/9/98). Although these historical figures cannot be traced to any certain date, the warrior Parusharam is mentioned in the ancient Vedic text Bhagavad Purana, that is believed to record an empirical Indian history from around 7000 BC. Parusharam is the historical figure to whom one lineage of varman teaching is attributed (Kuti, interview, 14/10/98). The second source, the sage Agastya, appears to be a contemporary of the Chinese Lao Tsu (5th Century BC). Agastya’s history is mentioned several times in the text Mahabharata. He is believed to be responsible for many texts on Dravidian varman theory, including some original medical texts held in Dharamsala, northern India, and is referred to as “one who lived for many centuries” and “the sage of Asian appearance” (Nair, interview, 24/9/98). According to some Dravidian practitioners, he is dated to 2500 BC, around the same time as the mythical Chinese emperor Huang Di. The evidence which supports the dates and events surrounding the authors of Sanskrit and Dravidian classical literature is inconclusive and is currently under debate. The dates of artefacts such as those containing the Harappan symbols are uncertain. 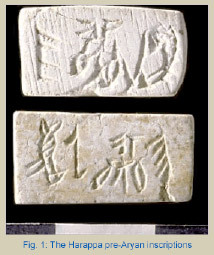 These symbols, which were found on unearthed stone seals in northern India, have been likened to Chinese characters (Harappa discussions, July, 2000). These non-translated pre-Aryan inscriptions, which are attributed to the civilisations of northern Indian Harappa (2000 BC), affirm an Indian indigenous culture, believed by Indologists to have ended around the period of 1700 BC with the introduction of Vedic culture (Harappa discussions, July, 2000). There is evidence of Chinese channel theory in the form of a lacquer figurine, from the second century BC, recently found in tombs excavated at the edge of the foothills of Tibet (Lo, 1998). This supports the possibility of the cross pollination of medical ideas, including those of Indian marman and Chinese acupoints. 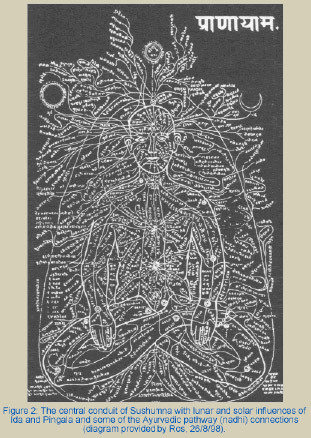 The early northern Dravidian shamanic medicine is thought to have given rise to the eventual development of Ayurveda as a medical system and to have brought about the spread of traditional Indian medical thought to other countries, including Tibet and China. The extant Ayurvedic texts, plausibly dated to around the 2nd Century BC, define marman as the “107 marman according to Susruta” (Thatte, interview, 21/9/98). This view was accepted by all Ayurvedic practitioners interviewed during field research. 1) Ayurvedic marman as recorded by Susruta (5th-2nd Century BC) in the classical text Susruta Samhita, (Sarirasthan, Chapters 6 and 7, trans Thatte, 1994) and later elucidated by such classical writers as Nagarjuna (1st Century BC), Charaka (1st Century AD) and Vagbhata (7th Century AD). 2) The Dravidian varman which is recorded in the undated Varman-adi Shastra (“the books of varman action”); a collection of writings attributed to a long line of teachers, including Agastya and Purusharama. Both systems recognise 108 marman, including the 107 marman listed by Susruta, suggesting orthodoxy amongst Indian marman doctrines at some stage. The Dravidian varman model, however, claims to use an extra 720 therapeutic varman, in addition to the known marman of Ayurveda (Pillai, private communication, 26/11/99). Classical Ayurvedic treatment of marman is concerned with recovery from physical trauma. There is no evidence to suggest that marman were considered suitable for therapeutic puncturing, as in the case of Chinese acupuncture. Indeed, marman are believed to contain the elements of life, including the life-force (prana) which supports consciousness. Disturbing the life-force of marman was thought to be detrimental to health, therefore cutting marman was, and still is, prohibited amongst traditional Indian surgeons who follow the precepts of Susruta Samhita. This view of marman has its origin in warfare, and much can be learnt about Indian marman as well as Chinese acupoints from the texts on traditional martial arts (Kasulis, 1993; Rocsu, 1981; Zarrilli, 1998). Further research regarding the vital points of martial arts may enable a better understanding of “secret” points and their little understood contra-indication within both the Chinese and Indian systems. 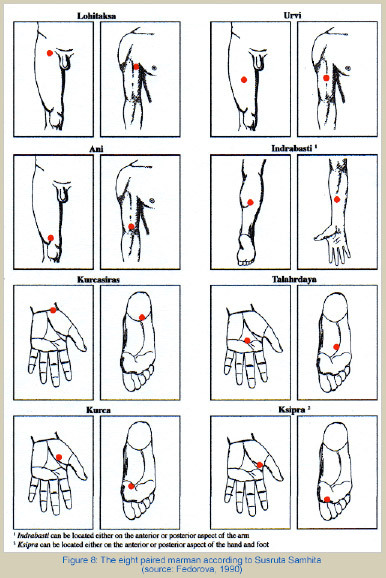 The Chinese on the other hand, have a long tradition of using therapeutic techniques, including acupuncture on acupoint sites. Evidence of the early development of acupuncture is suggested by the existence of the bian stone needle from the 10th Century BC Shang dynasty (Eckman, 1996) and the 2nd Century BC writings of the Huang Di Nei Jing (trans Veith, 1972). Marxist China in the 1950s produced “a combination of the positive elements of Western and Chinese medicine with the establishment, along Marxist lines, of a new medicine” (Unschuld, 1985, p 252). While the dialectical materialism of Mao Tse-tung contributed to the form of Chinese medicine known as TCM, India had no such creation of a “new medicine”, and the heritage of secret family medical traditions remains. It is possible, therefore, that an arcane knowledge of marman exists in India. This was the view of Ayurvedic practitioners, who believed that ancient varman texts were likely to be in the possession of traditional Dravidian (Siddha) practitioners. The importance of marman groups and their affects on the human body. The application of Indian marman appears to fall into two categories. Firstly, marman (lit. secret points) are used therapeutically throughout India in varying forms of massage. Secondly, the ancient systems of warfare (Dhanurveda) and the Dravidian (southern Indian) Varman-adi (lit. the action of varman) are still used in traditional Indian martial arts today. The text Mahabharata records that the warrior caste was well trained in marman-striking with fists and weapons, “for maximum effect with minimum effort” (Date, interview, 26/8/98). These early Vedic records of marman are supported by the medical works of Susruta (500 BC), a surgeon and philosopher who recorded the effects of trauma to marman in the Ayurvedic classic Susruta Samhita (Date, interview, 26/8/98). Sanskrit texts such as Ashtanga Hridaya (trans Vogel, 1965) and chapters 6 and 7 of Susruta Samhita (trans Thatte, 1994), uphold the vulnerable nature of a marman, listing as a contra-indication any form of surgery across the surface of a marman. Classical Sanskrit texts give a prognosis regarding injury to any marman, classifying them in five groups (See Table 1). Table 1 illustrates five marman groups that are affected by trauma, according to Susruta. For example, if a group 3 (vishalyaghna) marman is traumatised, the elements of Air and Ether will produce pain or death, depending on how accurately placed the impact is to the anatomical centre of the marman. Depth of penetration into the site of a marman will also determine any pathological outcome (Thatte, interview, 7/10/98). The early Ayurvedic physicians believed that the elemental balance of the human body could be affected by any loss of constitution. When pierced by a projectile, the outcome for group 3 marman is believed to be death, because the elements of Air and Ether are able to escape from the body quickly. It is noted that similar ideas were prevalent in early Chinese medicine, especially concerning the loss of qi through inappropriate needling techniques (Unschuld, 1985, p 583). 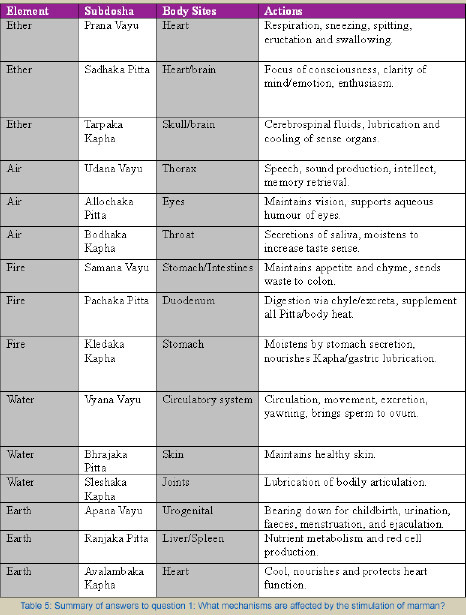 According to Ayurvedic and Dravidian philosophy each marman group is ruled by one or two of the Five Elements and has a constitution of up to five types of tissue at the anatomical site of the marman, viz. muscles, vessels, ligaments, bones and joints (trans Thatte, 1994, p 114). These elemental and constitutional components, along with the total number of marman within each group, are listed in Table 2. When physical trauma is applied to vital areas of the body, such as the basti marman, located in the region on the anterior mid-line and superior to the edge of the pubic synthesis, effects such as reproductive dysfunction will result. In the example of trauma to basti marman, the prognosis will be impotence in males due to the blockage of the physical structure of the channel (srota), the ductus vas deferens (Pandit, interview, 5/9/98). This view was reflected by teachers at many Indian Ayurvedic colleges. Marman are often taught from a surgical viewpoint, with cadaver dissection a common teaching practice in India today. 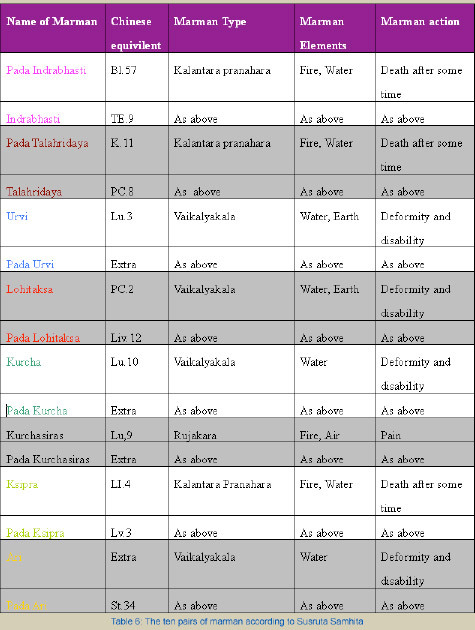 The marman locations are taught in a traditional manner, in chart form, according to the precepts of Susruta Samhita (See Fig. 1). 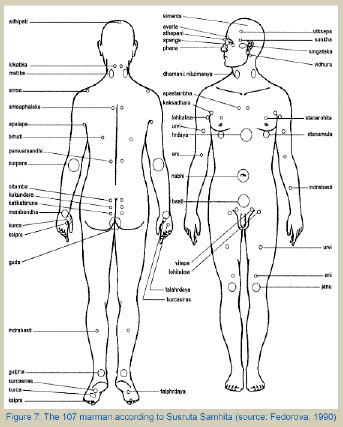 The Susruta Samhita records the anatomical divisions of marman according to tissue types and structures at the body sites (see Table 3). Additionally, Susruta and other classical commentators have listed the number of marman in five body regions (see Table 4). Marman are believed to be inter-connected by the manifestation of “pranic currents of energy in the body” (Lad, 1985, p 56). 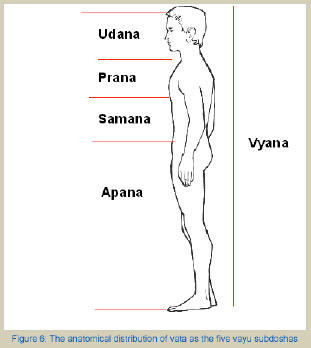 The prana (life force), which is believed to circulate to the marman, can be categorised according to the element and dosha components found at the site. The importance of prana in the role of marman action appears to correlate with the Chinese model of qi circulation. Prana circulation in the human body has been recognised for at least 4,000 years, as illustrated by the ancient inscription “Seal of the Indus Valley” (2000 BC), excavated at Mohenj-Daro by Sir John Marshal (Zysk, 1998). This ancient Indian relief of a seated human figure is seen to have “meridian lines (vital air passages) which connect with vital points” (Manickavasagam, 1993, p 19) (See Fig. 2). This suggests an ancient Indian view, similar to that of the Chinese concept of qi and its circulation through the jingluo (network influence), as reflected in the writings of the Nan Ching (The Classic of Difficult Issues), a text believed to date to the 2nd Century BC (Unschuld, personal communication, 23/4/00). The deeper roots of marman science can be understood in terms of yogic science. This involves the nervous system and the three primary nerve roots, the Ida, Pingala and Sushumna, commonly referred to as the Kundalini (Date, interview, 29/8/98). Historically, the early invasion and destruction of northern Indian culture has meant that many classical texts on medical science either went to Tibet or to southern India in order to survive. Secrecy was important, to ensure the survival of tradition and knowledge. Today we are left with this secrecy, and only a few people have inherited traditions such as marman (Date, interview, 29/8/98). According to Unschuld (1985), the early invasions of northern India before 500BC accelerated a cross-pollination of ideas with Chinese culture. The original meanings of some ideas were lost in the translation from Sanskrit to Chinese, as in the case of the word “dosha”. It is believed that aspects of Ayurveda, including Ayurvedic surgery (shalya tantra) and Indian martial arts were introduced into China, both openly and secretly, before the time of Hwato (1st Century AD). Ayurvedic practitioners agree that trauma to a region of a marman may cause derangement to human physiology by influencing the doshas and subdoshas. 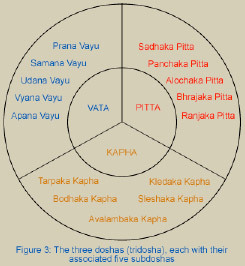 Each of the three doshas, (kapha, pitta and vata) are potential faults in health (Lad, 1985). According to interviewed Ayurvedic practitioners, the doshas exist in the body by the interaction of the five elements, maintaining balance and supporting the physiological function of the body. The subdivisions of a dosha, the subdoshas, are believed to carry out specific functions according to the elemental qualities of the “parent” dosha (See Fig.3). Ayurvedic practitioners believed that a marman has the potential to disturb the doshas and subdoshas, or to restore healthy physiological function. The tridosha is further divided into 15 subdoshas which are thought to play a central role in maintaining the equilibrium of the body, especially the vata (vayu) subdoshas. “Vayu is controlled by prana, and prana is influenced by marman” (Bhide, interview, 4/9/1998). The Sanskrit word vayu is translated as “the wind of the body, the vital air” (Cologne Digital Sanskrit Lexicon, 14/8/2000). This aspect of vata dosha is termed “the maintainer of the human machinery, keeping it in natural order” (Thakkur, 1974, p 37) and is divided into five subdosha components according to Ayurvedic theory. The idea of the five vata (vayu) subdoshas may be compared to the Chinese concept of qi (as air qi, true qi, food qi, defensive qi and nutritive qi) and its functional and anatomical designations according to Macioccia (1989). Vata dosha is believed to have ascending qualities. It is located in the pelvic region, thus countering the descending function of the intestines by the ascending qualities of vata. Pitta dosha is thought to relate to Fire and Water. It is regarded as the centre of life and maintains digestion. Kapha dosha is considered to have descending qualities. It is located in the chest region and is said to be kept buoyant by the ascending influence of the lungs. Ayurvedic theory holds that vitiated doshas are pathological and will affect the subdoshas, the biological regulators within the human body, thus affecting the physiological balance of a human being (Bhide, interview, 4/9/1998). According to Susruta Samhita, marman will directly influence the dosha in conformity with the marman group concerned (see Table 1). 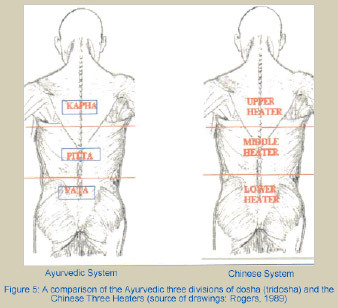 Figure 5 illustrates the similarities found within the three divisional systems of Ayurveda and Chinese medicine. According to Ayurveda, the chest “houses” the influence of the lungs and heart, and therefore requires the nourishing effect of kapha dosha which is seen to reside in the region of the chest. The area below the navel is considered to be heavy and viscous by nature and requires the light, elevating influence of vata dosha which is said to reside in the hypogastric region. In the Chinese model, Earth (Middle Heater) is placed at the centre (see Figure 5) and the channel system is thought to be generated by Heaven, Earth and Humanity, manifest within the body as the Three Heaters (Unschuld, 1986). In the Ayurvedic model, the 15 subdoshas are controlled by the three doshas and, in particular, the movements of vata (vayu). 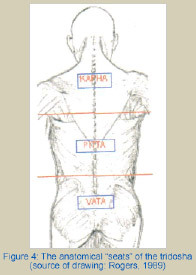 The distribution of vata dosha throughout the body is maintained by the five vayu subdoshas, which are allocated to five body regions (see Figure 6). The 107 marman, according to Susruta Samhita, are illustrated by Fedorova (1990) (see Figure 7). Of these, 16 are said to form eight pairs. Each of the pairs represent an anatomical symmetry between the proximal, medial or distal aspects of the upper and lower limbs. These paired marman are illustrated in Figure 8 and listed in Table 6 with their Chinese equivalents. The relationship between the marman which are paired appears to be based on anatomy, although it is claimed that traditional Indian and Chinese medical theory and practice was predominantly physiological and pharmacological, not anatomical (Ames et al, 1998). The location of six of the eight paired marman were found to be consistent amongst Indian practitioners. The two exceptions are ksipra and indrabhasti and the former has a correspondence in the Chinese system, known as “the four gates” (si guan).